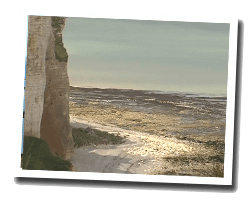 Sassetot-le-Mauconduit is a village perched on a cliff near Fécamp. At the seaside there are two beautiful beaches of sand and pebbles: the Petites Dalles beach and Grandes Dalles beach. The landscapes inspired Impressionist painters, including Claude Monet and Berthe Morisot. Popular resort in the 19th century, it has kept old villas. 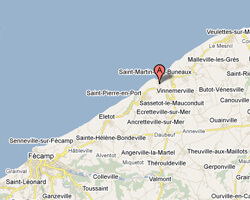 In Sassetot-le-Mauconduit enjoy a seaview holiday rental. On the seafront, this 32m2 design, warm and welcoming charm you with its location and stunning views of the sea and the beach of Petites Dalles. 1 Bedroom(s), 1 double bed(s). short stays possibility. Final cleaning : 20 €. Price from 370 € to 470 €.